This past Tuesday I reached a major milestone in my life. 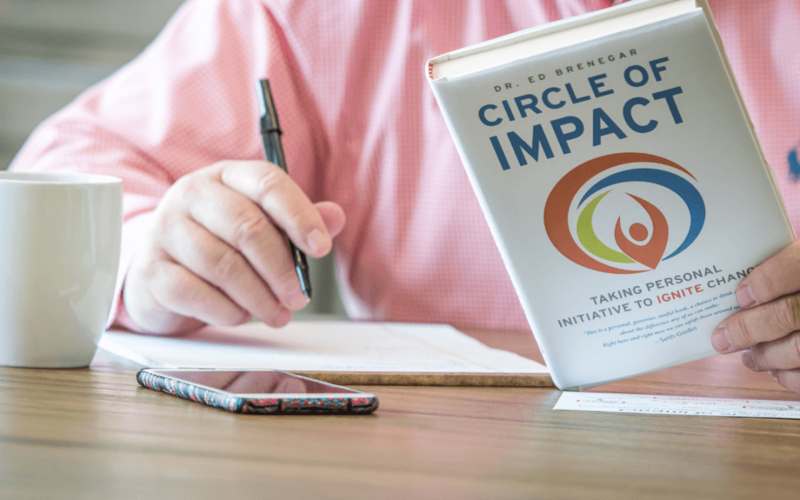 My first book, Circle of Impact: Taking Personal Initiative To Ignite Change, was published. People who know me are aware that this has been a life-long goal. They celebrate with me this personal accomplishment. I’d ask why? The range of responses would go something like this. Each of these excuses goes to a central theme of the Circle of Impact model. No one knows what they can do or can’t do until they try. I’m not talking about climbing Mt. Everest. Most of us are not equipped physically, mentally or spiritually to take on an extreme endeavor like that. Writing is not like that. Embedded in those reasons why someone can’t write is a confusion about the purpose of writing. It seems that they think of it as an obligation to someone else. It isn’t. I write to learn and clear my head of all the thoughts that are constantly flowing through my mind. I have been carrying a Moleskin journal around with me for decades. Mine can fit into the back pocket of my jeans. When I have a thought, I write it down. If I’m traveling, and have a brainstorm, I pull off into a rest stop and write down what I’m thinking. I also have an app on my phone called Paper by FiftyThree. Half of the first version of my book was written on this app in the middle of the night lying in bed. Same is true for writing. My first venture into writing for publication was in the late 1990s as a community columnist for the Asheville (NC) Citizen-Times. I had to learn how to write a complete idea in 500 words. Shorter is harder than longer. The secret? Stop using adjectives and adverbs. Then, five years later, they hired me to write a business leadership column, which I wrote for four and a half years. It was good practice because it helped me find my voice and style. In 2004, I began a weblog called Leading Questions, now dormant. Over the 14 years that I wrote it, I learned to shift from being a consumer of other people’s writing to being the creator of my own. This change is from being a critic of other people to being a contributor to the solutions that we need in our world. This is what practice does for you. There still must be a reason to write. My impression is that most people think that writing is about expressing themselves in words. That is true, but not what is primarily important. I find that people, in general, have ideas that are poorly formed. We’ve all been in situations where someone just keeps rambling on about some idea or issue, and no one really knows what is the point. Their thoughts are more notions based on feelings. There is a certain tyranny that we experience when the deep thoughts within us lack clarity and direction. The practice of writing, whether for yourself or for publication, is first and foremost so we can actually know what we think. I knew this woman who told the same stories over and over again. I’m not sure she was aware of that behavior of hers. The stories were important to her as a way to define what is meaningful to her. But just telling the stories in conversation had never brought her to a realization of why these stories mattered to her. When we write to articulate what we think and feel, we discover our true selves. We learn WHY we think a certain way. We gain insight into the pain and conflicts that we have suffered in life. Yes, writing can be a form of therapy, but it is so much more. The reasons why people don’t write, like the list above, are often expressions of self-doubt or simply a lack of imagination. Self-knowledge is one of the benefits of the writing process. To write in clear, coherent complete sentences is a form of self-mastery. To learn this requires us to submit ourselves to a kind of self-criticism that is hard for us. However, it is also liberating. We discover who we are and who we are not. It is the closest thing to a bottle of self-confidence that we can find. If you desire to write for publication, you will discover that it is harder work than maybe you have ever done. The hard work is not about choosing the right words, but rather dealing with your own competing feelings of failure and joy. Some days the words don’t come. Other days they just flow with ease. My close friends here in Jackson Hole where I live have commented on changes they have seen in me. I attribute it to the writing process. I want you to understand what this means. He was right. I cannot tell you how liberating it was to be released from the first version being the final version. He was correct. Two new chapters, another reorganization, and six edits later and I give you the book that was published this week. At each step of the writing process, I was learning and changing. My understanding of my model of leadership that I created almost two decades ago continues to change. Just yesterday, in a conversation with a young man, I saw the answer to a question about the Circle of Impact that I’ve had for years. As soon as I spend some time with that idea, I’ll write about it. Writing is not an end in itself. It is a process of self-discovery, personal articulation and a path to making a difference in ways that fulfill our desire to be people of impact. I can’t tell you how, when or what you should write. I can only tell you that you must do it. Do it for your life now, and, possibly for the life you live in the future that may make a difference because you discover something within you waiting to be released to make a difference in the world. I wish this for every one of you. Write on. Write on. Write on.